Stockholm Archipelago Self-guided Kayak Explorer gives you the chance to discover this beautiful region at your own pace. 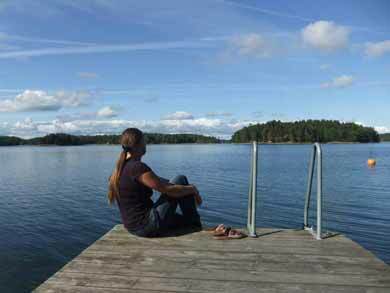 Easy to reach in less than an hour from central Stockholm, from the start point there are more than 300 islands to explore within a 10km radius, and the city feels a million miles away! Stretching from the northern part of the island of Ljusterö up to Dalarö, the Middle Archipelago ("Mellersta Skärgård" in Swedish) is a beautiful area of the Stockholm Archipelago and ideal for exploring by kayak. 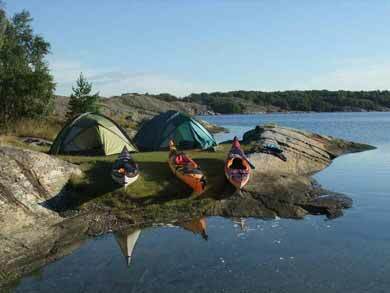 The combination of self-guided kayaking and wild camping gives you great freedom to create your own adventure! Photo: HK. The landscape of the Middle Archipelago is one of forested islands, reed-covered bays, small beaches and smooth granite rock outcrops, with almost endless possibilities for good swimming, lunch and overnight camping spots. With no tides in the archipelago and a wide choice of route options to choose from, trips can be easily adapted for the most sheltered conditions on the leeward sides of the islands, making self-guided tours an accessible possibility for a wide range of guests (novice kayakers are recommended to take an introductory day course available as an optional extra). Less experienced paddlers will be advised on the most sheltered routes, while those with greater experience can explore the more open waters of the outer islands. The route is flexible to paddle in more sheltered or open areas depending on weather and your level of experience. Photo: HK. The area is also rich in wildlife, with white-tailed sea eagles and ospreys regularly seen, while mammals include hares and roe deer. You may even find the occasional seal greeting you on your trip (seals are most commonly found further out in the archipelago but do occasionally travel further in). 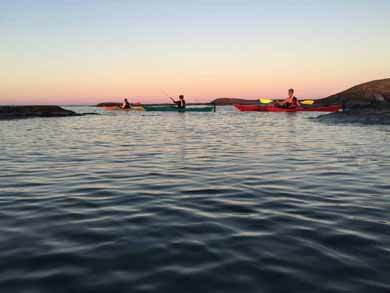 With start days flexible between May and September and any duration from 3 days/2 nights up to a week or even longer if you wish, Stockholm Archipelago Self-guided Kayak Explorer is ideal for couples, groups of friends or families. Both single and double kayaks are available. Why not take a day or so either side of your tour to discover the beautiful city of Stockholm - the "Venice of the North" in combination with your tour? If possible, you should plan to overnight in Stockholm before your tour and arrive at the kayak centre between 10-11.30 (unless choosing introductory course, in which case please confirm start time for your course). For guests who wish to travel to Sweden the same day, later start times (up to 17.00) may be possible by arrangement. You will explore the Middle Archipelago region at your own pace, route taken, distance covered and level of challenge dependent on your own experience/abilities and weather conditions. Wild camping each night. Example areas to explore include the following. Note that if you are travelling outside the main summer season, some archipelago facilities such as stores, etc, may not be open. You will have the opportunity to discuss the most suitable route options depending on the current wind/weather conditions when you begin your tour. Located 15km from the start point lies the island of Träskö Storö. Paddle through a network of archipelago islands to reach the island, varying your route as much as you wish, and enjoy a wonderful relaxing sauna at the end! There is a small fee, payable locally in cash, for use of the sauna. No camp fires are permitted on this island. Another wonderful island to explore, "Hastnäcken" (The Horse's Neck) is located at least a 10km paddle (which can be extended as much as you wish depending on the route you plan to get there!) from the kayak centre and the majority of the island is now a Nature Reserve. As a protected area, no fires are permitted on the island. Located close to the start point, "Stora Sandön" (Big Sandy Island) offers wonderful beaches and a good choice of suitable places to camp, ideal for an easily accessible short paddle on your start day! Please return to the kayak centre with your equipment prepared and cleaned by latest 17.30. You are welcome to return earlier in the day if you wish. Start any day between 01.05 and 28.09.19 (latest end date 30th September). Minimum duration 3 days/2 nights, extra days optional. Note if paddling early/late in the season that you should be prepared for cooler conditions. NB: Minimum period 3 days/2 nights. Each group requires at minimum 1 x map and compass set. Weekly price applies for rental periods from 5 days/4 nights up to 7 days/6 nights. Equipment prices below are for any tour duration up to 7 days/6 nights. For longer durations, please contact us to discuss your requirements. Bilge pump and paddle float: We recommend this for participants familiar with rescue/self-rescue techniques, at least one set per group. Tent (2-3 persons): Tents normally used are freestanding MXR Elixir 3. Sleeping mat : Foam Thermarest. Private lesson (2 hours): Total price for 2 persons, offered at times by arrangement, subject to availability. For larger groups, please contact us to discuss your requirements. Day's coaching or guiding: Total price for group of up to max. 4 persons. For larger groups, please contact us to discuss your requirements. Wetsuit: You may wish to use a wetsuit for your tour, especially if paddling early/late in the season when the water is cold. 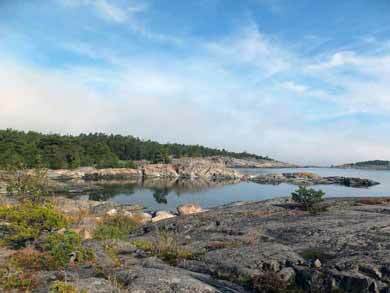 However, in general wetsuits are not normally considered necessary for kayak tours in the archipelago. Sea kayak and all necessary equipment including paddles, buoyancy aid and splash skirt, map case with map and compass. Necky kayaks are used, normally Looksha 17 and Eliza for single kayaks and Looksha T for double kayaks. Accommodation: Camping equipment is available to hire as an optional extra. Accommodation is wild camping and there are no "proper" toilet facilities during the tour (there are some stores/restaurants in the archipelago area open during high season). You will be given information on how to deal with your toilet waste, etc. Food: You should purchase provisions for your tour in Stockholm. We recommend that you bring essential provisions for your tour with you from the start. There are some stores in the area open during high season to complement your supplies (though in general we do not recommend that you rely on this for essential provisions as you may arrive outside opening hours). Dry bags (can be purchased on arrival if required). Suitable for novice and experienced paddlers (route chosen can be varied depending on experience). All participants must be able to swim and be used to the outdoors. No kayak instruction is included. Novice kayakers and participants without knowledge of safety and rescue techniques are strongly advised to choose introductory tuition on the start day (see under "Optional extras"). Novices may also prefer to request double kayaks, which are the most stable option. Min. 2 adults (18+) required. Minimum age 7 if using double kayak together with adult. Minimum age to paddle single kayak 16 years (except if suitable previous kayaking experience). While strong winds are rare, weather conditions can of course vary and you should be comfortable on the water in different conditions and bear in mind that this is self-guided tour in a marine environment. Depending on the route taken, it is necessary to cross some areas of open water where boat traffic operates. Please don't hesitate to ask if you have any questions regarding your suitability for the tour. There are generally few waves when you are paddling in the protected waters between the islands of the archipelago. There are no currents/tides in the archipelago. The tour is a self-guided experience in a marine environment with wild camping each night. In windy conditions the water can be choppy and the water can be very cold if paddling early/late in the season. As there is no fixed distance to cover, the level of challenge can easily be varied from accessible to hard depending on weather conditions and level of experience/fitness. This experience is ideal for groups. Read Jayne and Niki's trip report on the Nature Travels blog. We also offer a guided version of this tour.